In case you’ve been living under a rock: the new James Bond film, SPECTRE, will hit theatres on November 6th, with Daniel Craig returning as Bond, Sam Mendes back in the director’s chair, and a cast that includes Ralph Fiennes, Ben Whishaw, Naomie Harris, and Rory Kinnear. To celebrate, Belvedere is launching two custom made and limited edition bottles. They’ve replaced their iconic Belvedere Palace with MI6 headquarters, and a run of only one hundred bottles will have their distinctive blue switched for MI6’s preferred green. 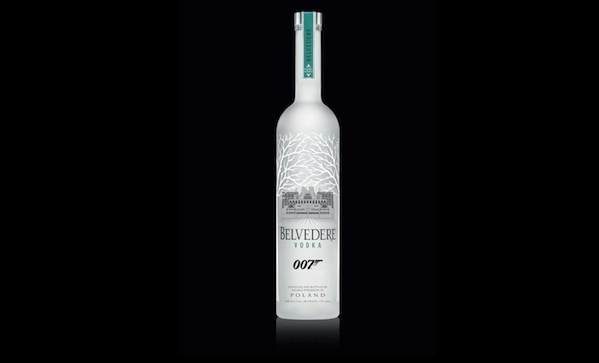 Of course, Bond and Bond fans come down on the vodka side in the perennial gin v. vodka debate (which, as we’ve previously discussed, is a silly discussion), and a vodka martini made with Belvedere is dry, smooth, and worthy of the world’s most iconic spies.